I am high above the clouds en route to Naples but in my mind is an English summer fair held almost three weeks ago at Whiteley Village. The sky that day was the same blue as today’s with storms smudged briefly across the far horizons. Whiteley, a retirement village, is a web of cottages set in acres of Surrey. Its annual summer fair is a well-known local event. This year it was hot. An ice-cream van dotted the crowds with dripping cones while beneath the bunting skin ripened, bands tootled and stalls set out their wares. The visitors were a mixed selection of locals and the further-flung, with a strong dash of Zimbabweans adding to the flavour. We discovered the Zimbabweans because they discovered us at the fund-raising stall for Veterinarians for Animal Welfare Zimbabwe (VAWZ). Here is an extract from the VAWZ website. VAWZ (Veterinarians for Animal Welfare in Zimbabwe) UK has been set-up by vets to improve the welfare of animals in Zimbabwe. We care for all animals in need, including wildlife, domestic pets, farm animals and working animals. Our agents in Zimbabwe are on the road all day every day and have treated everything from rhinos to goldfish. 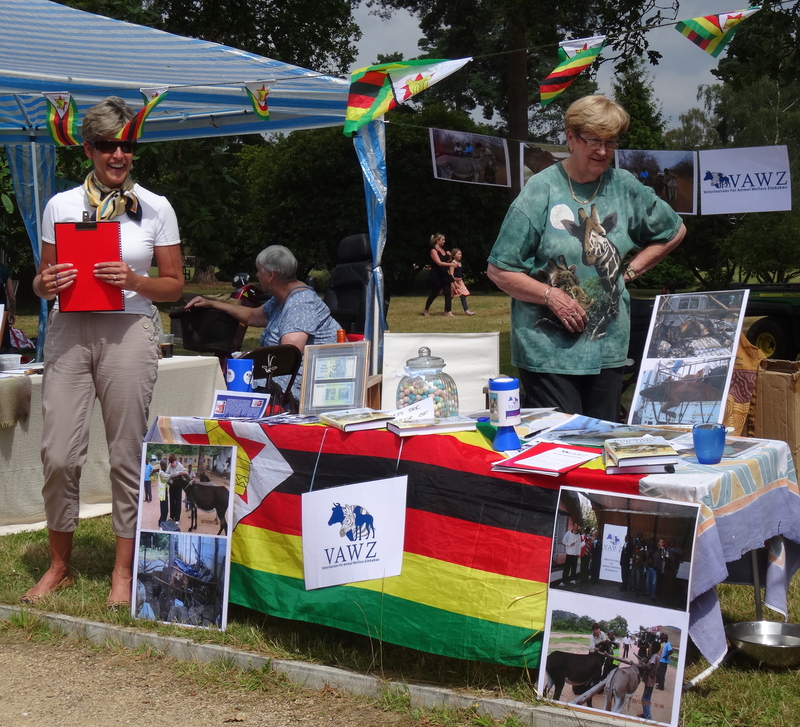 The stall, run by Meryl Harrison and Cindy Griffiths, two of the VAWZ (UK) trustees, was easy to find – the Zimbabwean flags caught the sun whilst the photographs of damaged Beitbridge donkeys were difficult to walk past without a second look. Meryl Harrison, who rescued animals stranded on Zimbabwe’s farms during the farm invasions at the start of the new millennium, has worked on the frontline of animal welfare for many years. She has now ‘officially’ retired but cannot forget the plight of the 50,000 donkeys in Beitbridge. She knows how much work they do and how many strands of support are needed for them, their owners and to keep the drivers safe who to and fro over the busy Beitbridge border into South Africa. At Whiteley many who stopped to chat had some local experience of the difficulties faced and were aware of the desperate need for improvements. It made sense that the VAWZ projects for Beitbridge weren’t too grand – just feasible small steps to help heal harness wounds, educate owners, and provide access to fresh water and veterinary support. I watched from the sidelines for most of the day. It was wonderful and strange to be at a summer fete in England and to be on the edge of so many re-connections with Zimbabweans from around the world. Gleaming in the collection that came to the stall were two visitors from opposite ends of a century. The first – a freshly minted baby was out for the day with his parents, his American cousins and their Chinhoyi grandmother who now works at Whiteley. The American cousins claimed the VAWZ ‘jar of sweets’ by guessing to within a few sugar drops the correct number of bonbons piled up behind the glass. The second – the stylish Freda Hodgson from Zimbabwe, was accompanied by her grandchildren who were over from Singapore. Freda, unlike the baby, had no intention of dozing off. She had already completed her first century and had decades to share and a party to plan for September. In between the brand new and the vintage there were plenty who stopped to find out more on the plight of Zimbabwe’s animals and to buy several of the last remaining hard copies of Innocent Victims from Meryl. It was a poignant day but a positive one. The donkeys in Beitbridge might have been thousands of miles away but the links were strong and the memories, thanks to Freda, reached back to the First World War. If you would like to donate to support the work being done to alleviate the suffering of the Beitbridge donkeys please click on this link – many thanks. Happy 101st birthday Freda Hodgson! This entry was posted in Meryl Harrison, Zimbabwe and tagged Beitbridge, donkeys, Meryl Harrison, Veterinarians for Animal Welfare Zimbabwe (VAWZ) UK, Whiteley Village. Bookmark the permalink.